Moulid El-Naby is the prophet Mohamed’s – peace and blessings be upon him – birthday. It is considered a tradition more than a religious day, still it is a happy occasion for family get together. Muslims’ around the world honor that day by celebrating in many ways – the best way is to follow his teaching. 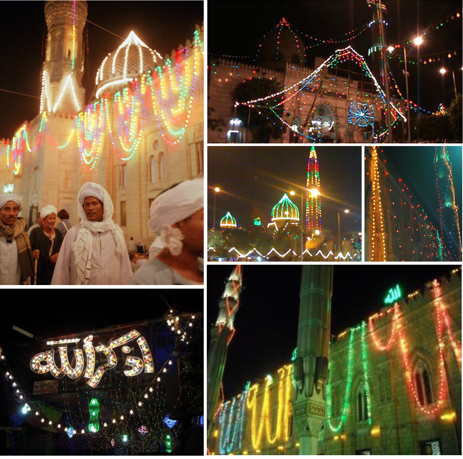 Mosques are decorated in colorful light strings and shapes and the market is filled with ” Hawalwet el moulid” which is special kinds of candies that are only available at this time of the year. Here is a picture of a box filled with these yummies. Moulid El-Naby is on the 12th of the lunar month of “Rabi al-Awal”, the third month in the lunar Islamic calendar, which is going to be Jan 13th, 2014. 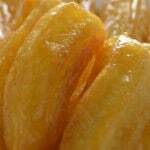 I will introduce you to many of the candies manufactured for this occasion and we will try to do them at home as well. 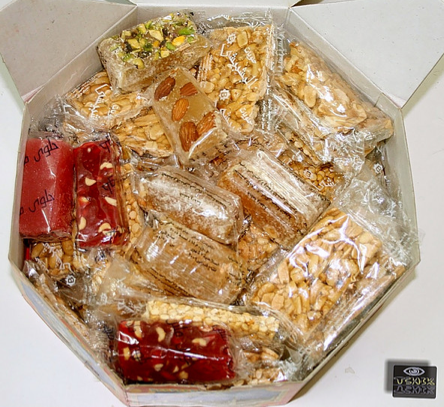 Today’s candy is called semsemeyah which is a sesame candy … this candy was made only with sesame seeds and peanuts when I was little, but nowadays it is made with all different types of nuts like almonds,hazelnuts and cashews. 1 1/4 c of sugar. drops of rose water. I’ve used vanilla extract too. In a sauce pan on a medium heat combine sugar ,water and corn syrup mix well and keep stirring until the sugar is dissolved then add the lemon juice and rose water. lower the heat until it becomes really thick as pictured above. Turn off the heat. Now for the sesame candy I added two Tbs of the above thick syrup to 1/2 c of roasted sesame seeds … you may need more of less but what we want is to form a sticky mixture as shown below in the first picture. With the help of a parchment/wax paper try to shape your mixture into a rectangle. Let it set for 15 minutes until it hardens. Then with a sharp knife cut into small rectangles, I like to cut mine in bite size. I did it using cashew nuts but I did not roast them… it turned out nice but I think if I had roasted them they would have been nicer. Tip: to keep the syrup from hardening while you make the candy try to keep it warm in a hot water bath. 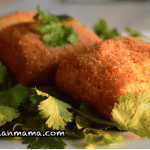 was wondering where i can order halawat el moullid here in california or is their a store i can go? I guess in California there are so many Int’l markets there. I can find some here in the Iranian marker but not quite as the ones I used to have in Egypt. That’s why I am making my own :). I can’t wait to try this recipe! I can’t get corn syrup where I live. Is there a substitute I can use instead? Thanks! I’ve been asked the same question in my Arabic blog – moghtareba.com- from a follower who lives in Ireland. So if you are there- or I think Europe in general- there is a good substitute called glucose or else golden syrup. Corn syrup can also be replaced by a sugar syrup. Combine one cup of pure cane sugar with 1/4 cup of water and heat over a low flame, then add 1/4 teaspoon of lemon juice, stir until it is thickened enough to reach the soft ball stage. An easier and healthier alternative is honey, although it is sweeter and might give a slightly different flavor but I think it is the best. I hope this helps you. I love sesame seeds and I would also do them bite size. Sometimes just a bite or two of something sweet after dinner is all I need. Keeps me from eating a huge dessert. Thank you! Thank you! Thank you for this post! 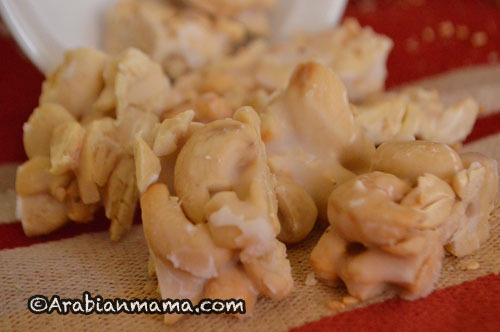 I recieved a box of these sweets from Egypt last year–they were so wonderful! I searched the internet for recipes but came up with nothing. Can’t wait to try this! I’m glad to help Amy. Thanks for your comment and come back for more :). Assalam alaikum Amira, thank you for stopping by my blog and leaving a comment. Its nice to meet a fellow CO blogger. 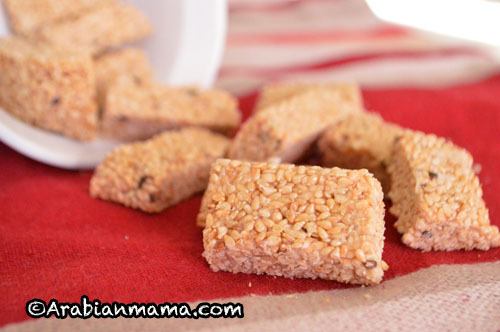 I adore the sesame candies but have never thought about making any, now I have recipe to try. Thank you! I hope you’ll try them one day and tell me. Take care.